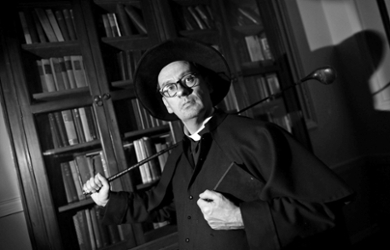 Dublin-based actor Donal Courtney’s one-man show “God Has No Country” tells the story of Monsignor Hugh O’Flaherty’s exploits in German-occupied Rome during the Second World War. Though little remembered today, this unassuming Irish priest used his connections in the Vatican to harbor prisoners of war and Jews and was ultimately responsible for saving over 6,500 lives. The play follows O’Flaherty’s torment as he decides to act in defense of those suffering under Fascist tyranny. It delves into his tortured relationship with SS Obersturmbahnnführer Herbert Kappler, the head of the Gestapo in Rome whom he ultimately received into the Roman Catholic communion. It also reflects on his upbringing in Killarney and on how joining the priesthood protected him from involvement in the Anglo-Irish War. Told with humor and sensitivity and performed with great Irish élan, “God Has No Country” aims to bring the heroic deeds and achievements of this extraordinary but unsung man to a wider audience. Each performance of the play will conclude with audience discussion and Q&A with Mr. Courtney. Likely topics of discussion will include Ireland, Father O’Flaherty, playwriting, one-man shows, Italy, the Vatican—in short, all the many richly interrelated subjects the play raises. Mr. Courtney is a vivid, funny, and charismatic conversationalist. The Q&A will be a memorable part of the experience. Additionally, Mr. Courtney will lead a two-hour workshop on “Acting Irish” for theater, playwriting, and literature students on Saturday, April 1. His visit is sponsored by the Humanities Project (a program of the Humanities Center), the International Theatre Program, the Departments of History, Religion and Classics, and English, and the Jewish Studies and Italian Studies programs. About Donal Courtney: Originally from Killarney (where he discovered and tutored a young Michael Fassbender), Donal Courtney graduated from the Gaiety School of Acting in Dublin in 1991 and has since worked in theater and television in Ireland and abroad. Besides appearing in many stage and screen productions, he has written and directed many plays, including “God Has No Country,” which has recently been published as part of the Junior Cycle English Curriculum in Ireland. Performances are March 31 and April 1 at 7pm in Todd Theatre. All performances are free and open to the public.